Description of "The Dynamic Business Plan"
In The Dynamic Business Plan you find core knowledge about starting and running a small business. The basic skills of running a privately owned business are the same around the world. If you acquire these basic business skills you will be able to navigate as a business person. The Dynamic Business Plan is directed to the reader who is professional in his or her skill but not skilled in managing a business. You could be an IT expert, an engineer, a graphics designer a man or woman with a degree in hospitality management or a retailer with ambitions. You may be ambitious and go for an exporting multi-million dollar business. Or you may wish for a small home based business while raising your children. This book embraces them all. The owner, author and editor of DynamicBusinessPlan.com is Mr. Mogens Thomsen, a Master in Management from the University of Southern Denmark (Scandinavia). He works as a business consultant at the largest and most well respected entrepreneurship centre in Scandinavia. On a daily basis he advises entrepreneurs in business start up and in development of their businesses. He has written several books, teaches international students and has implemented many successful online guides about entrepreneurship. 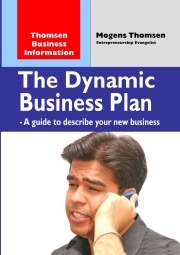 Reviews of "The Dynamic Business Plan"